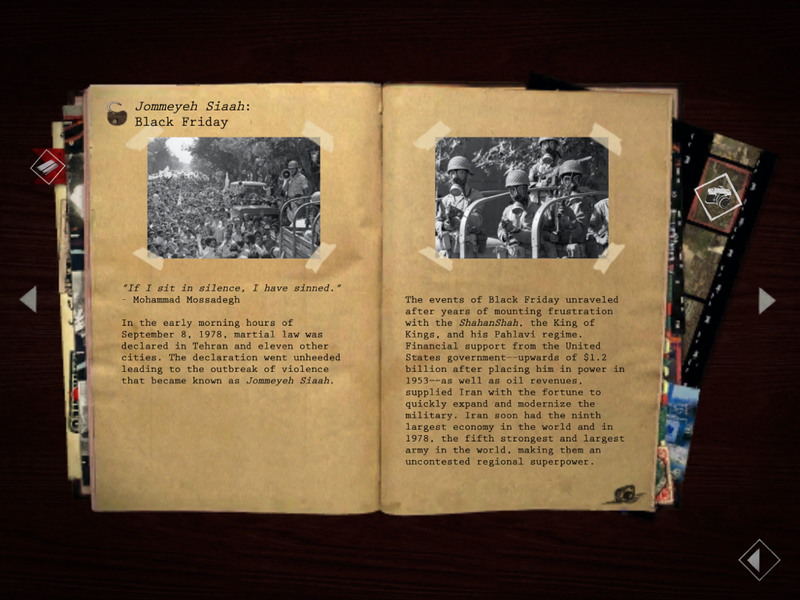 iNK Stories’ 1979 Revolution: Black Friday is not your usual game. It blends storytelling with gameplay to create a documentary-like experience that’s both educational and entertaining. It recently made its way from PC to iOS and no, it’s not referring to the Black Friday where you trample other people to get an HDTV for a hundred bucks. Black Friday refers to September 8, 1978, when the Shah declared martial law in many cities in Iran. Citizens took to the streets in protest, which eventually led to the Iranian Revolution of 1979. 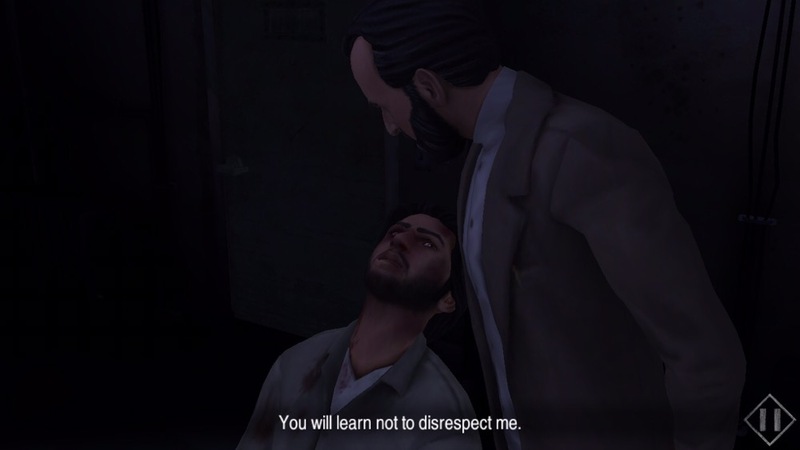 The game starts off in 1980 with your character, Reza Shirazi, getting caught and thrown in Evin Prison, where he’s interrogated by Asadollah Lajevardi, known in real life as the Butcher of Evin. 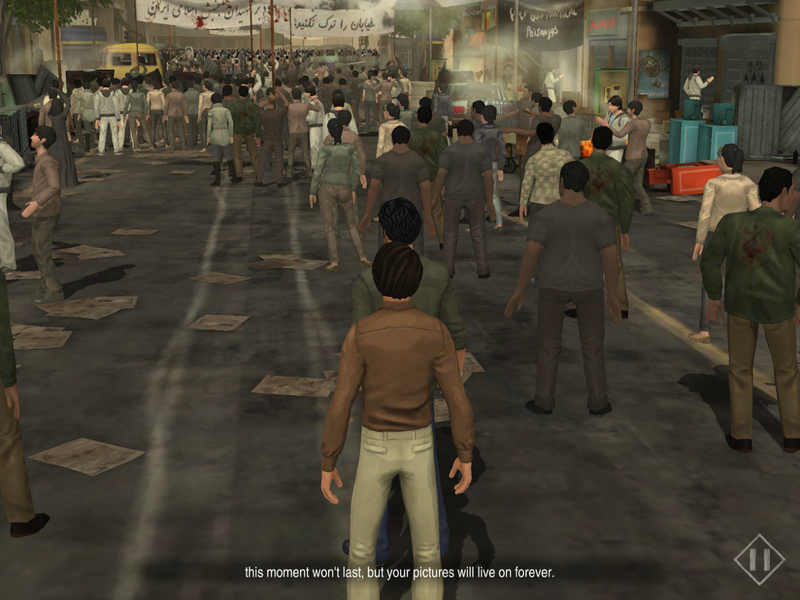 The chapters alternate between intense prison scenes and flashbacks to Reza’s involvement in the revolution. He came home to Iran during the revolution as an eighteen-year-old just wanting to take photographs of the events, but that soon changes. His friend, Babak, shows him around, introduces him to other protesters, and convinces him to use his camera as a weapon against the oppressive government. Reza’s cousin, Ali, thinks violence is the answer and tries to convince him of the same. Even though you, as Reza, get dragged into the revolution, you have the choice to go along with it willingly or to argue every step of the way. You also decide which method of protesting to support. 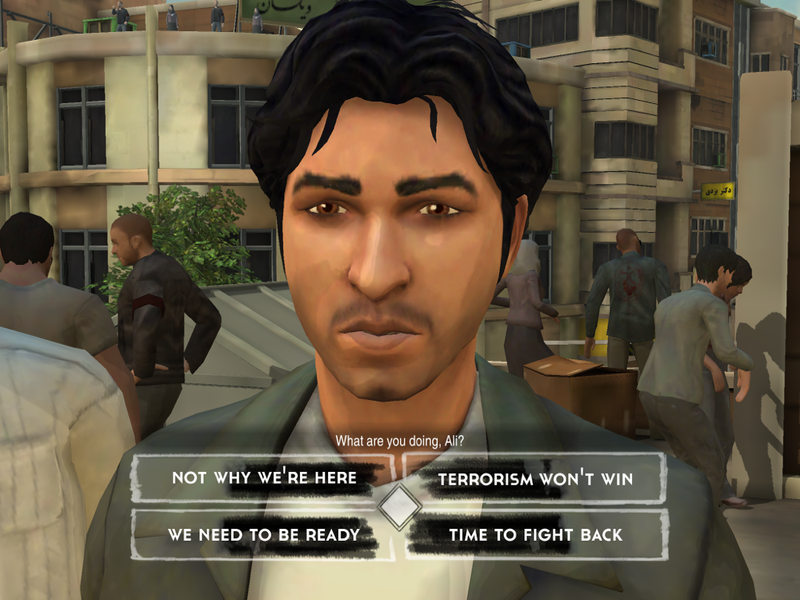 The layout is very similar to that of the Telltale games, including split-second decisions and quick time events (QTEs). From a gameplay perspective, it certainly could have used some improvement. I’m not a big fan of QTEs, and the fact that swipes sometimes didn’t register made them even more painful to bear. There are a couple of sections where this can get you killed, but the game lets/makes you try again and again until you pass those sections. So even though I found those to be the weaker parts of the game — and would have preferred something more puzzle-like — I was able to get through them after a few tries. Also, those looking for their choices to drastically change the story might be disappointed. But I did play some parts over with different answers and, although they all do seem to lead to the same place, certain choices can unlock extra bits that you wouldn’t have seen had you chosen a different dialogue option. So each person’s experience should vary at least somewhat. Throughout the game, you’ll often take on your role as photographer, using the joystick to move around and then swiping to point your camera at an important event. The camera mini-game is a simple one, but photos get stored as extras alongside descriptions of the events. You can also talk to some people and learn more about their situations. For instance, there’s a poor mother begging for change and a man wearing photographs of murdered revolutionaries. These sections of the game help serve as an interesting way to learn about the revolution. The walking can be clunky at times, and I once got cornered in by Babak with no choice but to restart the chapter, but it’s just a minor issue. Graphics aren’t the game’s strongest suit, but they certainly get the job done. Each character has distinguishable characteristics, which is important since there’s a large cast and it would be easy to confuse them if they didn’t have clear facial features. Despite some things that could be improved upon, the game shines where it matters. The dialogue sounds realistic and the voice acting is superb, bringing the characters to life even if their animations can be a bit stiff at times. I found the game gripping and educational, without getting preachy or cheesy. What really makes it work are the well-written story, characters and dialogue. 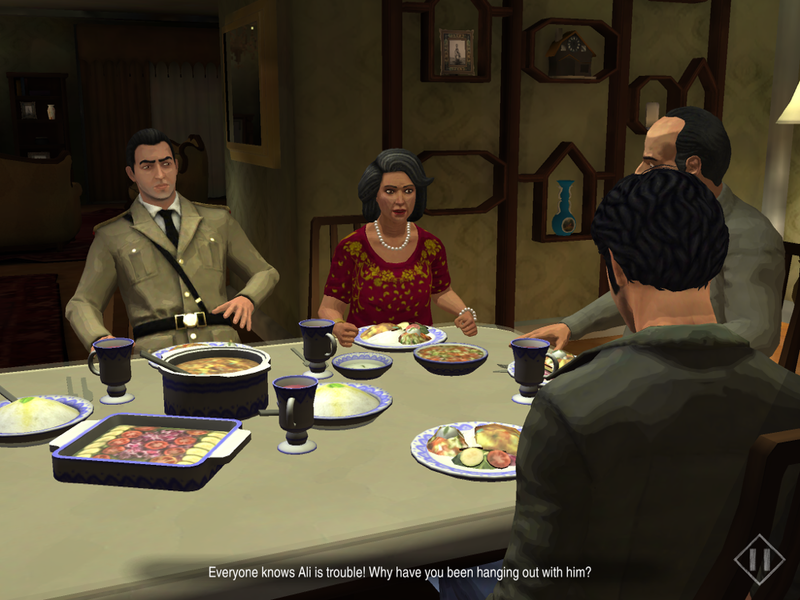 One of the most powerful scenes for me was when Reza goes home for dinner. His mother — like most mothers — tries to convince him to stay out of trouble. But his father pulls him aside and confides in him that he acted similarly in his youth, and that his mother is just worried about him. Scenes like this make it easy to relate to these characters no matter where you live or which side you’re on. Anyone can understand the situation even if you know nothing about Iran and the revolution. We even get to explore his parents’ home, which is full of memories that make the story relatable and the characters believable. Last week, I had the opportunity to hear the co-founder of iNK Stories, Navid Khonsari, speak at the Games for Change Festival here in New York City. He explained how they approached 1979 Revolution as a documentary and conducted forty interviews to get it right. He said he chose to tell this story through a game because wanted to create empathy by letting people experience the events through the eyes of someone who went through it. He feels that making the choices — even small ones — helps the story stick with you. I agree with this, as even though I knew it was a game, it got me thinking about my decisions. Is peaceful protest enough or should I throw that rock? Is the military really just “doing their job” when they use violence against the protesters, or are they responsible for their actions? Even though these small decisions you make can’t change history, they do make you think about how you personally would react in such situations. And considering how much unrest there is even in the United States these days, and belief that our government is not listening to us, it’s not so absurd to think that we may have to make similar choices for ourselves at some point. I was a bit disappointed that some things were left hanging. For instance, you have to choose who you think the mole is at some point, but that part of the storyline never got resolved. Did I choose the right person? I have no idea, but I would have expected a big question like that to be answered. The ending also wasn’t the most satisfying, as it ends abruptly on a cliffhanger. Right now there is no continuation planned unless there’s enough support. Still, the game is worth playing even if the story isn’t wrapped up neatly. It shows that a sensitive topic treated with dignity and respect can be incredibly effective. 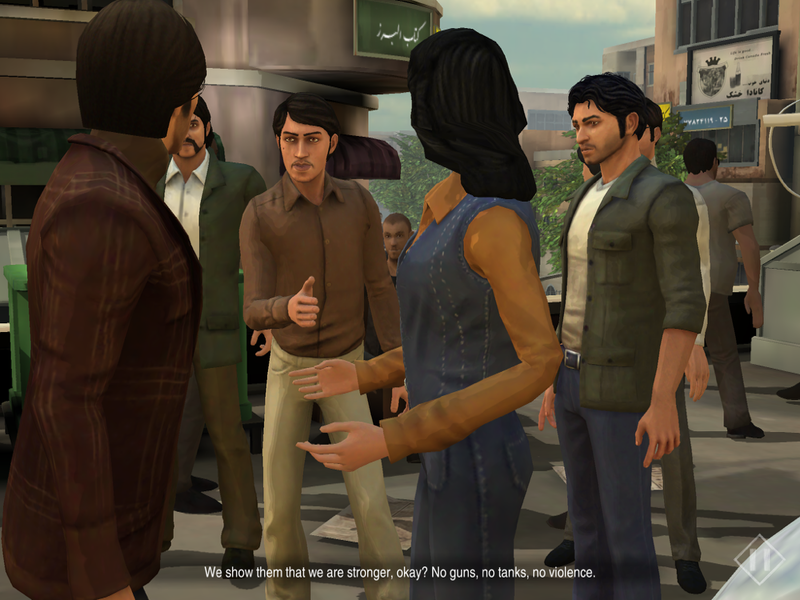 I admittedly knew very little about the Iranian Revolution before playing the game, but the setting, dialogue and characters made for an interesting way to learn about it. I never felt I was having a viewpoint thrust down my throat. Instead, my character was given opportunities to make decisions about which sides to take and how much he should get involved. After all, he’s “just a photographer.” As Khonsari pointed out, there are no wrong answers — as you can’t change history — but you can change your own personal narrative. The message I got from the game is that there’s no easy answer to these problems, and that’s why all points of view are given. Fighting or not fighting are choices each person has to make, and it’s not the developer’s place to tell you that you’re wrong. Do you risk your and your family’s lives and fight or do you lay low and survive? If you do fight, do you peacefully protest or turn to violence? You’ll encounter characters with all these different viewpoints, but you’re never told which one is the correct path. There’s even a point where you are given the option to pray, but you can refuse. Religion is the answer for some, but not necessarily your answer. That the developers approached the subject so carefully is what makes the game easy to recommend both to players and developers who want to learn how to make powerful experiences. If that all sounds good to you, you can download 1979 Revolution here.